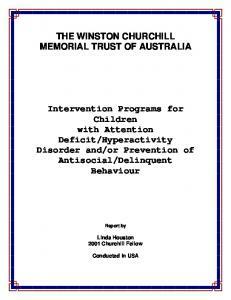 I understand that the Churchill Trust may publish this Report, either in hard copy or on the internet or both, and consent to such publication. 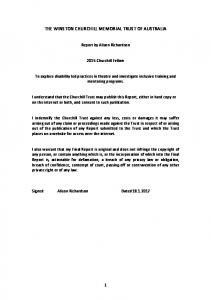 I indemnify the Churchill Trust against any loss, costs or damages it may suffer arising out of any claim or proceedings made against the Trust in respect of or arising out of the publication of any Report submitted to the Trust and which the Trust places on a website for access over the internet. I also warrant that my Final Report is original and does not infringe the copyright of any person, or contain anything which is, or the incorporation of which into the Final Report is, actionable for defamation, a breach of any privacy law or obligation, breach of confidence, contempt of court, passing-off or contravention of any other private right or of any law. The fellowship enabled me to investigate the ways different companies and governments have sought to address these issues. Rail tends to evoke strong emotive responses around the world. In many ways connection to the train line was the source of economic and social development. Moving both passengers and freight it is closely integrated into the social fabric of most western societies. 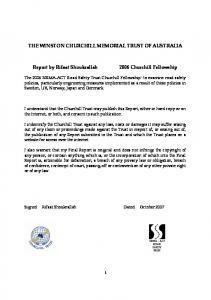 The Churchill Fellowship is a unique opportunity to engage with others from around the world, that have a common interest in transportation both road and rail. I found that when meeting people as a representative of the trust engendered a frankness and honesty that enabled insight into the major issues and opportunities facing the industry across different regions. Finally I would like to express my thanks and appreciation to my significant support crew, in particular my wife Suzie, Ellie and Archie, my parents and broader family and friends who all went out of their way to help make this possible for me. Jock Carter 15 Vernon St Cammeray NSW 2062 0427 283 999 Email: [email protected] To assess opportunities to enhance short haul rail distribution in regional Australia across North America, UK, Germany and France. Highlights Canadian Pacific, Calgary Canada – In depth meeting with senior executives from CP one of the largest rail businesses in Nth America and was given an insight from Class 1 railroad perspective on short line operations. I was also able to visit the CP Expressway operation in Toronto. Carry Transit & Bulkmatic, Chicago – Met with senior executives from two competing industry leaders and advocates of transloading from rail to road. I was also able to visit each of their terminal operations and experience transloading first hand. Saskatchewan, Canada – Ed Zsombor who led the regulatory team that pioneered the renaissance in short line grain operations in Sask. I was able to visit grower co-op, local trucking business and original short line rail operator as well as the home of the Brandt Road Railer. Freightliner, UK – Met with management and terminal tour of what I found to be the most progressive rail business that I have encountered. Modalohr, France – Met with the President and was able to see the entire Modalohr concept in operation one of the most innovative and complex logistics solutions I have seen. Major Lessons 1. The EU has managed to achieve co-operation across national boundaries for open access and standardisation of regulatory processes for the rail industry. There must be hope that we might also be able to overcome Australia’s state boundaries. 2. Deregulation and competition in the rail industry in every region has led to positive outcomes for both customers and railroads. 3. Access to terminals and rolling stock are key to a vibrant competitive rail industry. 4. Short line operations in both Europe and North America have been growing strongly. 5. There are a number of key innovative road / rail interfaces which could have application in Australia. The report is broken into four major components. The first is an understanding of the Australian rail context and defining the particular segment of the rail industry that the report is based on. Following is the broader industry dynamic in each continent looking at the macro factors which could be relevant in Australia. The report then lists a number of the specific innovative approaches to rail transport on a short haul context that I was able to view. Lastly there are a number of conclusions and recommendations as to how this information could be applied in the Australian industry. Regional rail landscape in Australia To understand the relative merit of approaches to rail transport overseas it is important to understand the Australian context. Rail as an industry is inherently complex due to the highly political and social interests as well as the significant capital requirements both in relation to rolling stock and infrastructure. To provide background to the insight gained through the Churchill Fellowship the first chapter highlights the regional rail landscape in Australia. This incorporates the current state of the industry, why it is important to the future of the country and the key issues facing the industry. Definition of ‘Short haul’ For the purposes of this report it is important to understand the context of ‘short haul’. I have categorised freight into four key categories:1. Urban Freight – moved within the metropolitan region a. Generally not rail suited 2. Inter-capital Freight – interstate freight movements between capital cities a. Suited to rail due to distance and terminal infrastructure b. Dominated by containers c. Ability to operate scheduled services 3. Bulk Commodity Heavy Haul – Coal and iron ore a. Strongly suited to rail due to reliability and economies of scale in volume b. Point to point operation with little variation 4. Short haul Regional – this encompasses freight movement’s 250-800kms in distance in outer urban and regional areas and often across existing state boundaries. a. Has struggled to maintain rail services b. Characterised by different products and service requirements c. Relies on strong links with road freight d. Rail infrastructure focussed on state capitals – not necessarily where freight is required to move. This report is focussed on the Short haul regional segment for a number of reasons. Firstly it is the ‘swinging’ segment, where there is an inherent ability to utilise either rail or road freight where as the other segments all tend to favour one particular mode. Secondly it is a segment that will grow dramatically in the future and the effectiveness of this segment will also shape the growth and success of regional areas. The scope of this fellowship does not encompass inter-capital or bulk commodity heavy haul where rail is the natural economic solution. Rather it is focussed on whether there is a future for rail servicing the regional short haul market? The relevance of rail in regional general distribution In considering the future of this segment there is no doubt that as we stand today rail is becoming less and less relevant, to the point there is almost inevitability about its demise. Once upon a time most small towns all had rail services and you could move just about any product on rail. The railways were state owned and controlled. The reality was also that the service was very poor and the costs to provide some of these services were frightening. As a result most significant industries in regional areas moved to road based logistics services. Throughout regional Australia there are many industries that generate considerable volumes of freight. However they require some flexibility and service levels that historically have not been able to be met by state owned rail service providers. As government bodies often they were not prepared to take responsibility for goods in care or service performance. Rail has also sought significant volume and there has been limited opportunity for smaller more flexible more respondent technology. New distribution hubs have generally been designed and constructed with limited or no rail connection. The best examples of this are major retail distribution centres which have been located regionally without good rail links. There no ‘emerging’ rail transport businesses in Australia. Most of the smaller privatised rail companies have struggled and continue to struggle to survive. Large privatised rail corporations have actively moved away from the general freight task. Even the larger volume regional volumes like grain have become unattractive after years of prolonged drought and services have been withdrawn. The road transport sector has pioneered many of the technological innovations globally and continues to develop higher productivity solutions, yet the rail industry has struggled to embrace innovation and is still operating equipment built over 50 years ago. The industry is failing to attract new investment. Rail continues to dominate the heavy haul commodities iron ore and coal however regional and agriculture sectors rail is becoming no longer relevant. Products like petroleum and other industrial products no longer move by rail. Economic future of regional industries and communities is dependent on efficient transport links to promote economic growth. Australia is already heavily urbanised and as the population grows (in line with forecasts) it will become critical that regional areas are able to shoulder this growth. With exponential growth of population and freight volumes over time it is critical as a society to extract more value from existing infrastructure. Currently the rail infrastructure is relatively underutilised and forms a great corridor for the movement of freight through urban areas. As the urban area continues to grow and becomes more densely inhabited the existing corridors (both rail and road) become key. In particular the rail corridors in many areas are underutilised. Congestion is already a major issue in all mainland capital cities and with limited options to resolve will steadily increase. The forecast large growth in the overall freight task will simply outgrow the available road capacity. o There is a limit to road capacity which is under pressure due to limited labour and likely capacity reductions due to new fatigue and mass laws leading to reduced driving hours and reduced weights. o The only rural industry that has remained largely rail based is grain and following privatization and successive droughts is currently being significantly rationalized. Significant community safety concerns as roads become more heavily utilized by both cars and heavy vehicles. The significance of the carbon foot print. Efficient rail services contribute significantly lower greenhouse emissions than road based solutions. Fuel prices and labour costs are the major inputs in road based transport costs and as these costs increase the relative economics of rail transport will become more beneficial. the rolling stock aged and customers moved to road in search of greater flexibility and service performance. In turn the loss of volume further impacted economies of rail operations increasing the costs and increasing losses for the government. Changes in production methodologies, towards lean manufacturing with smaller inventories both in and out bound requires faster more flexible transport services, which was not consistent with traditional government owned rail operations. Furthermore the network also largely ignored north / south freight flows with the directional focus on coastal regions. To this day there is no inland connection along the east coast and even within one state it is difficult to go in any direction other than to the coastal region. A further less obvious major implication of this environment is the significant increase in risk when investing in rail. Operators are unable to easily redeploy equipment to different areas. The secondary market for equipment is therefore constrained adding to the risk of investment for operators and potential financiers. Terminals Terminals are a major issue in Australia with any new rail operator largely excluded (in an actual operating sense) from the existing terminal infrastructure. The major shortcomings are:1. Terminals are treated as prized possessions as they represent a defacto monopoly control for rail operators irrespective of legislative efforts to create a competitive environment. 2. Many of the existing terminals are constrained by location due to the changing demographics of manufacturing and industry. The rail terminals in most locations were put in place many years ago and often over time the industrial areas have relocated further away from the centre of cities. 3. Older sidings are also generally small and operationally challenging for efficient rail operations. Rail is a significant opportunity in this context. Given the age of equipment and technology employed there are opportunities to make quantum changes. These opportunities are more limited in the road transport industry where potential gains will be around the margin. Australia has limited infrastructure and low levels of available infrastructure investment which makes innovation and opportunities to better utilise this infrastructure even more critical. After speaking with a number of key industry figures in Australia there was strong consensus that rail was unlikely to be relevant to the movement of freight other than designated bulk commodities such as coal and minerals or containers. The challenge remains to change both these perceptions and then the reality of the situation. The purpose of this trip was to investigate the different approaches taken in North America and Europe to moving freight on rail over relatively short distances and how in particular what innovations could be employed in Australia. Obviously it is important to understand the context of rail operations in different countries which have evolved differently in response to demographics, geography and political influences. In Canada there are striking similarities in the issues faced by Australia in relation to grain branch lines and they have been very successful in reversing the trend to closure of the outlying rail network. The UK provides an interesting model given their experience with privatisation, where the track assets were also sold and then when the experiment failed taken back under control of the government. They now have a functioning open access competitive rail industry operating on common access state owned infrastructure. They were fortunate that they were only dealing with one jurisdiction as the system was national (not state based). Europe provides an insight to how Australia might approach resolving the significant impediments to effective rail industry imposed by the state governments. The EU has had to grapple with the cross border issues in the context of different nations, languages and cultures and yet has managed this far more successfully than Australia! On a macro sense, each geography has different concepts that offer value to Australia. In addition there are many detailed innovative approaches to rail, and rail / road interfaces. with many of the same issues with the operations no longer classed as viable. In 1996 a new Transportation Act forced mothballed lines to be put up for sale at net salvage value. The government established a small department that was charged with management of the branch line network. 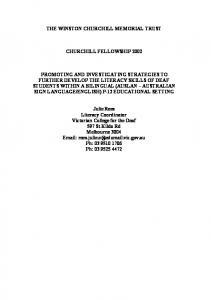 Their brief was not only to regulate but also to foster development. The experiment has been overwhelmingly positive which the branch lines remaining in action as a viable industry operated by small to medium sized short line operators. The keys to making this work have been:1. Engagement of local communities and farmer groups who are often involved in the operation. 2. Tailoring safety standards to suit the method of operation acknowledging that it is a very different environment to the mainline. In twenty years there has not been one serious derailment. 3. Flexible, generally non unionised workforce. 4. Access to different loading options varying from Terminals through to producers loading their own cars whilst the train is on the line. 5. Access to wagons through working with CP and CN. 6. Government support for track maintenance but all based on a co-contribution basis and if track was to close within 5 years of support then funds must be remitted to the government. 7. Focus on local development and community. North America encompasses a huge range of different rail operations and while there are significant differences to Australia (particularly in relation to track ownership) there are a number of key opportunities. Key Points:1. Deregulation and competition has led to strong growth in rail volumes and profitability. 2. Short lines are a significant industry in their own right and have succeeded through a combination of service and tailoring operations to the geographic requirements. 3. Large railroads are questioning the assumed ‘minimum distance’ for rail operations. 4. Access to wagon capacity is a key enabler of effective rail markets and the TTX model works very well. 5. Short line industry has become an asset to distribution in North America. 6. Standardised processes and procedures are critical to enabling successful interfaces between large and small rail operations. Privatisation and deregulation of above rail resoundingly positive for the growth and development of rail Government should own and control track on an open access regime. Private companies are not well placed to invest in track and see value in this only in the form of monopoly control of infrastructure. Investment in new rolling stock equates to good business practice Market for second hand rail equipment is critical to enable finance of new rail equipment. To achieve a liquid secondary market requires common standards and interoperability in equipment across regional boundaries. Rail services should be tailored to the environment – the example of operating fast, reliable services in the UK is critical as this enables interface with the passenger system. borders. The state owned rail systems of different countries are now competing across borders and having to allow competition internally. They have certainly put Australia to shame given the difficulty we have had in achieving anything like this degree of co-operation and change across state borders. Prior to the formation of the EU and the subsequent rail initiatives the industry across Europe was characterised by:1. 2. 3. 4. 5.
services is not in terms of rolling stock or subsidies but rather investment in terminals. Every representative in Germany that I met with reinforced the critical role terminals play in facilitating a vibrant rail industry. As a result the government provided interest rate subsidies to support terminal development on the basis that the terminal provides open access to other rail operators and improves overall efficiency. From a logistics perspective Germany stands apart from the nations I visited (and in particular Australia!) in relation to rigorous planning and tailoring infrastructure to deliver long term positive outcomes. In addition the government publishes a website actively monitoring and encouraging growth in terms of private rail operations. Last year Private operators grew by 5% compared with DB at 2%. This contrasts markedly with Australia where respective state governments have been far more concerned with potential private rail operators diminishing the value of their state owned entity. In privatising these businesses is has been in the interest of governments to minimise effective competition in order to maximise the value of the asset sale. Like the US much of the rolling stock was not owned by the rail operator which in effect creates a more liquid environment and enables the market to allocate resources more efficiently. Another key factor of Europe was the recognition of the importance of freight lines (recognising the strong passenger network and patronage) and the significant investment in freight only corridors across Europe. Key Points:1. EU and member government commitment both financial and in principle to fostering growth of competition and creating an environment that stimulates investment. 2. Focus on terminal access and development. 3. Focus on freight lines and the importance of service reliability to maintaining volume on rail. 4. Government, industry, wholesalers and retailers all committed to sustainable freight outcomes. 5. Deregulation and corporatisation has resulted in strong growth in both rail volumes and profitability. 6. Focus on intermodal systems and practical interfaces for road and rail. 7. Access to rolling stock assists in creating more dynamic rail environment. where these ideas could be applied. Colin Rees introduced me to a number of these concepts and he has fought hard to bring a number of these ideas to commercial reality in Australia. Transloading I was fortunate to meet with a number of transport companies who specialise in what is termed ‘transloading’ in North America. This involved the handling of bulk products from rail to road. This practice has been successful for Class 1 railroads, who in Canada operate their own terminals and the US, tend to focus on the mainline service with specific service providers managing the ‘transload’ and delivery to the customer. Both Carry Transit and Bulkmaster are specialist bulk logistics companies that operate trucks but also run significant ‘transloading’ facilities. Both operations handle difficult materials, in particular food grade materials and other highly quality sensitive products. The beauty of this process is very much in its simplicity. Trucks literally drive alongside the rail wagon and pump the product from the rail wagon to the truck. The operations are managed by a single driver and the process is relatively quick. In Australia these industries are serviced by road based transport solutions due to a lack of confidence in the ability of the rail provider to deliver on time and manage the product enroute. Typically the state owned railways had contracts which accepted no liability and took no responsibility of any type of delivery performance. In the US the specialised provider would liaise with the rail provider, the truck and the customer in order to coordinate the task. The concept worked particularly well where the transloading terminal had access to a number of rail operators which increased competition in terms of service and price but even more importantly provide the customer with additional supply and delivery options (remembering the US railroads have differing geographic networks). I have often been told Australia does not have the volume or the people to justify these sorts of operations. However one terminal I visited was built on the basis of handling 1000 rail wagons per annum (which has now grown to 4000-5000 per annum). This equates to an initial budget of approximately 80,000 – 100,000 tonnes per annum which is significant. However when you look at the raw material demand for a number of Australia food manufacturers in key metropolitan centres is relatively low. The terminal enables a manufacturer to source requirements from a number of different competing suppliers however all are compelled to utilise this pathway for their business. Terminals Effective access to terminals was a consistent theme across all the different countries. This was related to both accessing existing terminal infrastructure and the development of new innovative terminal structures. Effective ‘transloading’ operations require good terminal access and in broader terms the success of intermodal systems will generally be defined by the effectiveness of the Terminal. In Germany and France government support has been targeted towards development of better access and better quality terminals. This includes siding support to ensure rail access to new industrial areas. This is in contrast with Australia where many of the latest distribution centres have been built with little or no provision for rail access. The existing terminals in metropolitan centres like Enfield in Sydney and Dynon Road in Melbourne are no longer central to industry in the major cities. In the grain industry the combination of monopoly control and infrastructure constraints limits access to prospective new rail entrants. services very difficult. However the technology is proven and the business is well established. The changing economics into the future of higher fuel costs, labour changes and congestion on highways will continue to improve the relative merits of the operation. The operation is likely to have application in other key markets, particularly in highly urbanised environments. The concept also has significant application in Australia and could be adapted for mainline haulage between key centres. The combination of the significantly higher fuel costs and high truck capital costs make the economics more favourable in Australia as opposed to Canada and the US. The technology offers some advantages due to the light weight of the rolling stock however there are challenges with the considerable capital cost to establish the system and potential height restrictions in much of the rail envelope. The key benefit of the operation is that it enables the equipment currently utilised at both the load and discharge point to continue. This also has significant advantages in preserving the load quality and minimising the handling involved. It could be particularly well suited to trailers moving groceries or fuel which are lower in height and also tend to have similar configurations. In Europe a number of different approaches have been developed and two systems in particular have started to make inroads. Modalohr technology was developed initially for the transport of trailers over the French Alps to Italy. This has been successful although has also received some initial government support. Currently the route from France to Italy operates at over 80% capacity with 4 trains per day. The innovation involved is significant and enables trucks to either drop the trailers on the rail wagon (which are special low profile wagons) and also has provision to transport the prime mover as well if required. The design is very clever with rail wagons all rotating to enable trucks to drive straight on concurrently. As a result the time to load and unload the train is very short – 40 mins from train arrival to departure. This compares with 1.5 hours using the ‘Expressway’ system in Canada. The downside is that the technology is complex and expensive to establish. However this concept would be ideal in an area like the Blue Mountains. This particular road route is likely to be heavily constrained for heavy vehicles into the future and yet is the main trunk route for the central and western regions of NSW. Operating a shuttle type service between Bathurst and Penrith could be an interesting alternative for heavy vehicle movements. This system does not require special trailers at all although there would be some challenges when managing b-double combinations. The system also involves having more trailers in the pool than would be required in single trailer operation. One of the benefits both in Europe and North America when dealing with trailers is the largely standard configurations. Unfortunately it is unlikely in the current regulatory environment that this type of capital investment would be made due to the significant risks facing rail operators. A concept like this would require co-operation of key trucking businesses, government and in particular wholesalers and retailers. the MOBILER style system could be very effective as it requires low capital investment and does not require any changes at the load point or final customer. Technologically advanced equipment I have included the low tare, high speed freight services that Freightliner operates in the UK as another example of innovation. In the UK they are faced with very short distances and the Freightliner group has invested heavily in rail rolling stock which interfaces with the passenger network. The operation is based on fast, smaller trains that operate to regular schedules somewhat like a passenger service. As a result the equipment has a good payload to tare weight ratio and fuel efficient modern diesel technology. The Freightliner business has been a success story emerging from a loss making division of the government rail system to become both profitable and larger in scale. Utilising modern technology in terms of locomotives in particular, but also wagons. Similar to the Australian trucking industry their approach was to finance low tare, fuel efficient locomotives that were well suited to the UK conditions. This is a good example of tailoring the rail solution to the appropriate environment. Their intermodal business is based primarily in distributing containers from port to inland hubs. It is based on fast operation which is critical when working with passenger networks. able to pull 1500mt on the flat (3 times the original design). This technology would make a wonderful solution for branch line operations in NSW and Victoria where they could run wagons back and forward consolidating the loaded wagons to regional hubs for mainline trains. Again the challenge to an Australian company looking to invest in this type of technology would be overcoming the regulatory framework to make it operational and then getting effective access to terminals and rolling stock. In Canada the government rather than making this type of innovation difficult was actually involved in the design work, again when operating on remote branch lines they were not forced to comply with mainline rail protocols. In addition solutions were sought to enable loading wagons and wagons themselves are easily available. access to the network to operate, the inability to guarantee access to operators when required makes service performance difficult to achieve. 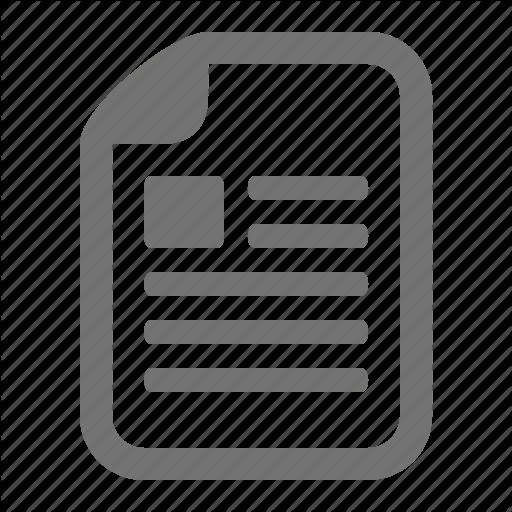 Recommendations Regulatory Framework 1. Create a regulatory framework that encourages participation and assists smaller market entrants to manage the risks associated with rail operations. a. COAG move as fast as practicable to legislate control of all regional and freight rail networks to the federal government. b. Federal government immediately following this pass control of all below rail assets to ARTC with the following mandate:i. Common signalling structure across all states ii. Common safety protocols tailored to operating environments (ie. Acknowledging that remote branch lines and urban infrastructure may have standards and protocols.) iii. Establish national track network which includes key regional centres and agree to standardise the national network from Brisbane south and west c. Develop a fifty year plan for freight infrastructure development incorporating the inland rail connection from Brisbane to Melbourne with particular focus on terminal land banking. 2. Pricing structure to encourage new investment and innovation. Track access fees should encourage new investment in technology that is low tare to payload ratio and low emission standards. Branch Lines Once under national control ARTC should establish a small working group with the mandate to encourage investment and rail operation in regional areas particularly branch lines. The model should be based on the Saskatchewan government. The brief of this group would be to regulate branch line operations but with the agenda of encouraging new investment and engagement from local communities. The measure of success would be based on industry activity and investment. Innovation The opportunity exists to introduce many of the innovative intermodal concepts to the market in Australia. This would be greatly assisted by support from the broader community and in particular wholesalers and retailers. Some of the key opportunities are:1. Modalohr and Expressway style services particularly in regions where the road network is poor like the Blue Mountains region of NSW. 2. Transloading is a great opportunity although needs to be driven through a partnership between road and rail operators – in particular those businesses close to the customer. 3. Road transferable locomotive has significant application for branch line grain operations if access to load points becomes more readily accessible. 4. Introduction of newer locomotive and diesel technology. Terminal Access Ideally separate control of key infrastructure terminals to independent parties that have a vested interest in maximising volume through the terminal. This applies to containers, general freight and grain export terminals. Whilst it is not possible to undo decisions of the past we need to encourage independent terminal development. Terminal access is a critical factor in fostering development of a vibrant rail industry. The more strategic and significant the more important it is that the terminal should have real independence. Good examples of this would be the major intermodal terminals in the capital cities. There is not the available land to have multiple competing terminals side by side. Hence an independent terminal motivated by volume throughput and having to offer transparent open access is likely to encourage additional rail operators. Planning of new industrial areas should be focussed on transport links both road and rail. This applies both in metropolitan and regional areas. Rolling Stock The establishment of a TTX style common user wagon pool for both grain and container flats in Australia would add considerable value to the industry. Availability and access to wagons will enable the market to price capacity. The success of the rail industry should not be gauged just in terms of tonnage or gtk measures but rather by the growth in terms of new market entrants and growth into freight markets more reliant on service. There is the potential for quantum improvements in rail operations and significant opportunities to realise far greater synergies between rail and road transport industries. The regulatory and structural changes that the EU has achieved could be replicated in Australia as we move to a national approach to transport and infrastructure planning. The forecast growth in freight volumes combined with likely fuel increases, labour shortages and the imperative to lessen the impact on our environment will all combine to make these improvements critical to our future. 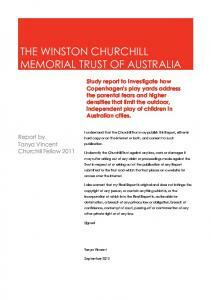 Report "The Winston Churchill Memorial Trust of Australia JOCK CARTER Churchill Fellow. 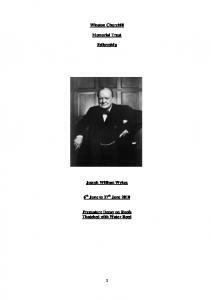 Fellowship Study Tour Report"